Face flies, Musca autumnalis, (also called the "autumn fly") is a non-biting fly species native to Europe and Asia. It was introduced in North America during the last century. Face flies are widely distributed in the regions of the Northern hemisphere with moderate climate. Face flies attack mainly cattle and can be quite abundant in cattle raising regions. They can also annoy horses and humans. 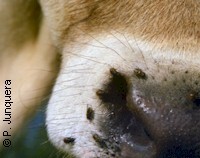 Face flies are usually not a problem for sheep, goats, pig, poultry, dogs and cats. Adult face flies are medium-size Dipteran insects 5 to 8 mm long. As all dipterans they have one pair of wings. Adult females lay eggs on fresh and humid cattle manure. Pig manure is also suitable for development, but not horse or sheep dung. Development to adults in the manure can be completed in less than 2 weeks under optimum conditions. Each female lays 100 to 200 eggs during her lifetime. Four to 7 generations can follow during one season, depending on temperature and humidity. Adult flies hibernate often inside buildings (stables, barns, etc.). Adult flies feed on nectar of various flowers and on cattle dung, but also on body fluids of cattle, particularly around the eyes, the nose, the lips or whatever injuries, e.g. those caused by other biting insects, where they may also feed on blood. Face flies are non-biting flies, i.e. they have no piercing mouthparts, and strictly speaking they are not obligate parasites. However, their sucking mouthparts are capable of scrapping the host's skin to make it exude, e.g. at incompletely healed scars. But they are usually unable to produce bleeding injuries. However they will feed on blood if they find it, e.g. on injuries or bites of other bloodsucking insects such as horse flies. Adult females particularly need protein-rich food in order to produce eggs, and they are more likely to annoy livestock than male flies. Adult flies visit their hosts repeatedly during the day, but stay only for a short time on them. When not feeding or at night they rest in the surrounding vegetation. 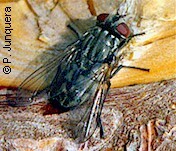 Adult flies live for 1 to 2 weeks in the field. Face flies are highly annoying and stressing for cattle. This can result lower weight gains and reduced milk production of up to 25%. Face flies transmit "pink eye" (also called "new forest eye") or "Infectious Bovine Keratoconjunctivits" (IBK), a disease caused by the bacterium Moraxella (Hemophilus) bovis. Face flies can be a significant problem wherever abundant fresh cattle manure is available for the flies to develop, i.e. on any type of free-ranging cattle operation. Face flies are less abundant and often not a problem in intensive and/or confined operations, where manure is either regularly trampled or removed. However, face fly control is seldom the first priority in cattle operations, and they are certainly less harming then horn flies. Fly-catching traps can be quite effective against face flies. Good results are often obtained with white-painted panels impregnated with glue. A combined use of such traps with chemical insecticides can be quite effective. Whatever destroys the cattle cowpats or accelerates their drying or removing will reduce the face fly population in a property. Mechanical methods such as using a drag harrow or a chain in pastures may achieve this, but they may be detrimental for dung beetles and reduce pasture attractiveness for cattle. So far, biological control using natural enemies of the flies, e.g. releasing parasitoid wasps has not resulted in efficient programs for face fly control. The reason is that parasitism of face fly larvae under field conditions is too low (about 2%) to have a practical impact on the fly populations. Dung beetles can quickly remove the cowpats and stop larval development of face flies. But the populations of most indigenous beetles are not large or strong enough to have a significant impact on the fly populations. And releasing non-native dung beetle species for this purpose always bears the risk that such species become invasive, get out of control and displace the indigenous species. So far there are no commercial products based on natural pathogens of face flies (e.g. bateria, fungi, nematodes, etc.) suitable for significantly reducing face fly populations in the field. Face flies are difficult to control. This is partly due to the fact that they remain only shortly on their hosts and therefore exposure to insecticides applied to cattle is often insufficient. 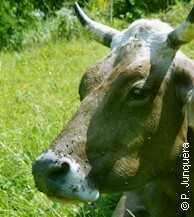 Many insecticides applied to cattle for the control of horn flies do not reduce face fly populations. Sufficient control is often achieved with insecticide-impregnated ear-tags containing synthetic pyrethroids (e.g. cypermethrin, permethrin, etc.) and/or organophosphates (e.g. diazinon). Control is usually incomplete but sufficient for a few months. Pour-ons, mostly with synthetic pyrethroids (e.g. cypermethrin, deltamethrin, permethrin, etc.) or macrocyclic lactones (e.g. doramectin, eprinomectin, ivermectin) may provide some control for a few weeks. Good results have been obtained with slow-release boluses containing insect development inhibitors (e.g. diflubenzuron, methoprene) or macrocyclic lactones (mainly ivermectin). Such boluses are capable of suppressing larval development for several months, which significantly reduces the fly populations. However, for such an approach to be successful it has to be used in vast areas in a coordinated manner, otherwise flies from neighboring properties can easily re-invade the herds. Larvicidal feed additives (e.g. with methoprene) mixed to food, water or in mineral blocks can actually interrupt larval development in cattle dung. However, the effective dose is much higher than against horn flies. Dustbags and back rubbers (oilers) can be quite efficient in controlling face flies, but only if cattle are forced to use them. However, both methods bear the risk of overdosing and subsequent potential issues with excessive residues in milk or meat; or underdosing of animals that for whatever reason get an insufficient contact with these self-treating devices. There are no effective repellents against face flies. Certain pyrethroid insecticides can have a repellent effect, but they are usually used to kill the flies, not to keep the away. injectables or drenches with macrocyclic lactones (e.g. doramectin, ivermectin, moxidectin, etc.) do not control face flies, neither adults on the animals, nor developing stages in cattle manure. If available, follow more specific national or regional recommendations or regulations for face fly control. So far there are no reports on serious problems of face fly resistance to insecticides. This means that if a particular product does not achieve the expected control, it is most likely because the product was not adequate or it was not used correctly, not because the flies have become resistant.